It hasn’t been all frilly frocks and silly shoes. I’ve had bigger, more important things on my mind. Like food wastage. Is it just me or is there a lot being written about it lately? I’ve been gripped because I care deeply about food wastage. But both time and my brain cells fail occasionally. And there is a point of no return when it comes to even the best of ingredients. So when I got back from work and opened the fridge to rescue the soon to go green rump steak, the leftover cheese and white bread stared right back at me. I was racked with guilt. Shoving the steak in the oven to slow roast, I poured myself a G&T and got work on an old recipe from my maternal granny – Cheese Bonda. I virtually grew up on this teatime snack of chilli cheese and bread bites, which are filling and wonderfully addictive. Also shallow fried. But what’s a few tablespoons of oil when you’re saving the world by default? If that’s not enough try a simple pulao, vegetable sabzi or a great big curry that you can enjoy even more a day later. Slice the crusts off the white bread. In a large mixing bowl, grate the cheese. Add the bread, chillies and onions. Wet your hand well and squeeze the mixture together, repeating the process until you get a smooth and hard dough. Shape into a large sausage and break into eight equal pieces. 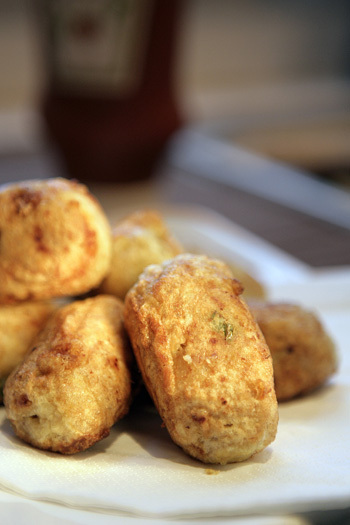 With your hands, roll into little sausages/croquettes and lay on the edges of a plate. Beat the egg in a small bowl and add the flour to the centre of the plate. Now bring the oil to heat over a high flame. Finally, roll each little bite into the flour, then dip evenly in the egg and fry in two batches until golden brown all over. Serve with ketchup and eat hot, hot, hot. now that looks real tempting!…whatever you say this looks sheer sinfully delicious!..no leftovers or what..I am going to make this…yes I too remember growing up on this..funny how we forget few things..thanks! But whatâ€™s a few tablespoons of oil when youâ€™re saving the world by default? That sounds fabulous, Mallika – chilli cheese rolls! Mmmm. I wonder if I can bake these? I’ve never deep fried! This is the first time I have seen these :). Loved them. They can be shallow fried also, cant they…. Thanks ladies. These are actually shallow fried, but I recommend a certain amount of oil because the eggy edges need to cook properly. This recipe really brings back memories. My grandmother used to make rolls like these, except she would use canned salmon instead of cheese. I think you made great use of those leftovers! Yumm! This is a great way to rescue, good one. Have a great weekend.Temp tomorrow here is 99F! Yikes! Those look fantastic – I will try them the next time some bread calls for rescue! hi i came through this website a few days ago by chance n become a fan of it…ur recipes sound so amazing,tasty n easy too…i tried these little savoury cheesy bites for a dinner party n they came out so amazing…they were a real hit…now i’ll always look for the excuse to make them..n definitely will try other recipes too..thanks for such a great recipe. What happens if one were to use health multigrain bread instead. just to avoid buying a loaf of white bread and then after using a few slices have the leftover white slices sitting in the fridge? Hi Mona, great idea! In fact, I’ve been meaning to try this with the seeded bread I buy too. Let me know what you think.